Am häufigsten gestellte Frage. Und die Antwort. Attention owners of Nokia E65 and other smartphones based on Series60 3rd Edition! 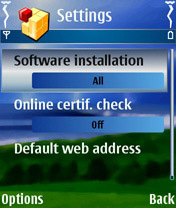 When trying to install themes downloaded from this site, you are most likely to get "Certificate Error" on your phone, and the theme will not be installed. 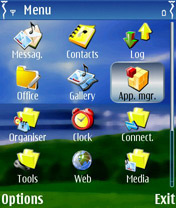 Find App.Mgr. in your main menu if you haven't moved it somewhere else already. Then open it. 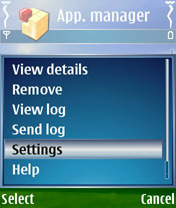 In Application manager press left soft button (Options). Choose Settings from the menu.